I’ve praised before on this blog the one-man wonder that is CB Editions, which scoops up the underappreciated and overlooked and gives them handso nic brown jackets and a much needed presence. David Markson, Gabriel Josipovici, Gert Hofmann, and others have benefited from Charles Boyle’s good taste. But as well as having an eye for literature, he can also turn it on: or out. Three of CB’s books are written by Boyle under assumed names: Jennie Walker’s 24 for 3 (which was subsequently reissued by Bloomsbury) and Jack Robinson’s Recessional and Days and Nights in W12. The latter, first published in 2007, has now been reissued in an expanded edition and carries praise from Geoff Dyer and Josipovici (who compares it to Sebald, Benjamin and Bernhard). And it doesn’t have a brown cover. 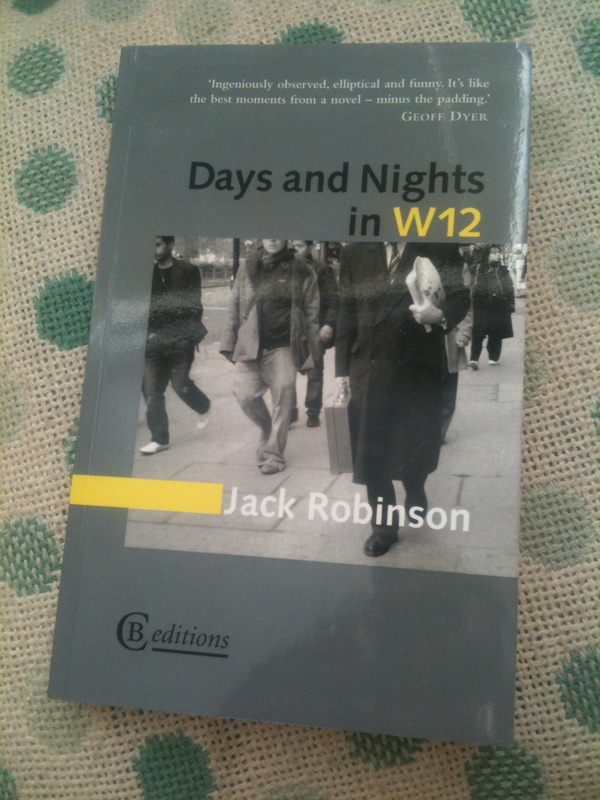 Days and Nights in W12 is a series of vignettes or meditations – more Dyeresque than Sebaldian – on the said area of London. The structure is simple: one hundred and ten pieces of prose (twice the number in the earlier edition), each less than a page, each topped by a photograph (ah! That explains the Sebald reference…). Each has a heading, arranged alphabetically, but otherwise without order or direction. They consist of memories, imaginings, and observations. The waiting time in A&E this afternoon is three hours and thirty minutes. And, truly, no one here looks as if they are about to die right now, or even in the next half hour; it feels more as if their flight has been delayed. […] After around an hour you are learning how to wait, and beginning to accept that hurt, pain, error and the need for help are not accidents or emergencies at all. Sometimes Robinson (let’s stick to that name) creates a whole story around one image glimpsed in passing (“Driver With Police”); elsewhere he begins with the sort of line that Lorrie Moore would kill for (“In the months after Ted’s wife died the various ailments that had kept him virtually housebound began to clear up”). Often the pleasure lies in the difficulty in establishing, without referring to other sources, what is real and what is invention, particularly when Robinson plays with known factoids (such as Walt Disney’s cryogenic afterlife). The King of Redonda is real (sort of), but does Javier Marías really lay claim to the throne, and has he “conferred dukedoms on, among others, Almodóvar, Coetzee and Alice Munro”? Does it matter whether it’s really true that “all public toilets and washbasins in W12 are designed by contemporary artists,” when the resulting fancy is so pleasing? What Robinson does is create a kind of twilight zone of west London, doing for Shepherd’s Bush what J.G. Ballard did for Shepperton. The easiest way to buy Days and Nights in W12 is by going here. Even with a brown cover you do a good job of making this sound unmissable. I love ‘bitty’ work such as this; anecdotal vignettes forming a strangely cohesive whole. It does sound very good. It’s interesting that he’s self-publishing effectively, though rather disguisedly due to the assumed names. Normally not a mark of quality but here it seems that doesn’t apply. Not sure where else to put this query. I thought you’d reviewed the Markson, but I can’t find it here. Did you read it? As has happened before, I was about to place an order with CB and then found there were too many books I wanted. The Markson is possibly one of them (the definites are the Hofmann and the Josipovici). Sorry Max, I haven’t read or reviewed the Markson. (I do have it though, and intend to.) Stewart McAbney has, at Booklit. Ditto the Josipovici. I have read the Hofmann though, and written about it here. Speaking further of CB, I read D. Nurkse’s Voices Over Water last month, a book of narrative poems about a European couple coming to live in Canada in the early 20th century. Recommended, as is pretty much everything published by CB that I’ve read. I must have been thinking of Stewart’s review. Thanks for the link. I’ve read your Hofmann review and remember it well. A definite must by. But then what from CB Editions isn’t?